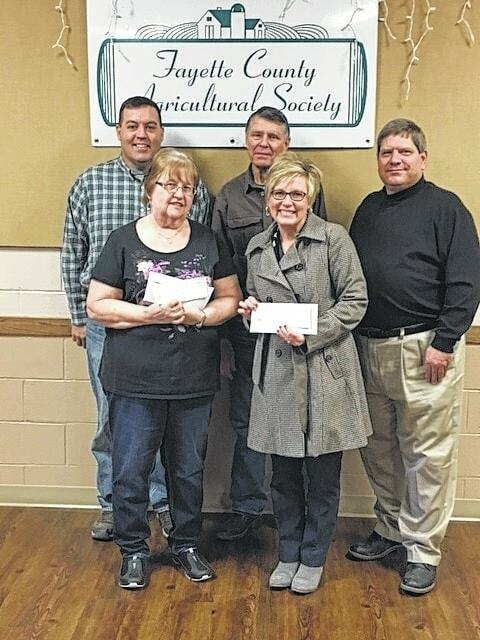 The winners for the Fayette County Agricultural Society raffle were picked Saturday evening. Pictured here (front row) are winners Maggie Overstake, who won the $20,000 grand prize, and Melanie Cockerill, who won the $5,000 second prize. Pictured with them (back row) are Ag Society Directors Michael Carson, Wayne Arnold and Doug Marine. The drawing was held at the Smokin Ham Dance Saturday, Feb. 11.
https://www.recordherald.com/wp-content/uploads/sites/27/2017/02/web1_RaffleWinner.jpgThe winners for the Fayette County Agricultural Society raffle were picked Saturday evening. Pictured here (front row) are winners Maggie Overstake, who won the $20,000 grand prize, and Melanie Cockerill, who won the $5,000 second prize. Pictured with them (back row) are Ag Society Directors Michael Carson, Wayne Arnold and Doug Marine. The drawing was held at the Smokin Ham Dance Saturday, Feb. 11.